The Route 91 Harvest Music Festival was going smoothly up until the last performer of the weekend. Moments after Jason Aldean hit the stage, gunfire erupted and chaos ensued. Stephen Paddock, 64, of Mesquite, Nevada, opened fire from the 32nd floor of the Mandalay Bay Resort and Casino in Las Vegas, Nevada shortly after 10 p.m. on Sunday, Oct. 1. The death toll has risen to 58, with the number of injured reportedly at more than 500, as of noon on Oct. 2. 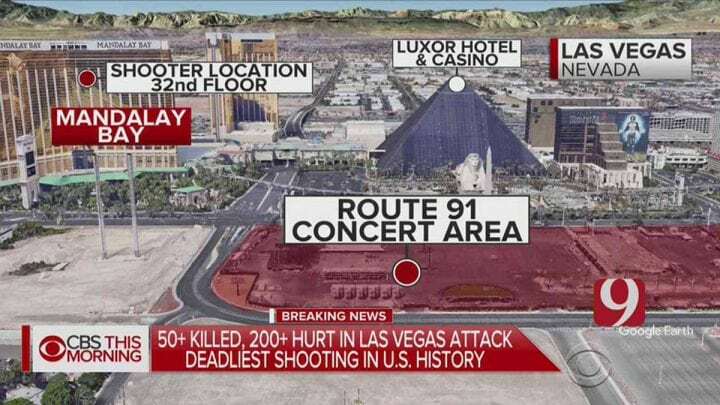 The Las Vegas Strip Shooting is now the deadliest mass shooting in United States history, surpassing the mass shooting at the Pulse nightclub in Miami last year. The attendance of the concert was approximately 22,000 people, officials say. Jake Owen was also on stage with Aldean when the gunfire started. Once safe, he sent out a series of tweets. Country artists and celebrities throughout the world are sending their love and support for those hurt or killed and their families. Devastating news about Vegas. We were not there but these were our friends & fans under attack. Spread love love love – it is much needed. This is the second attack at a concert this year, the first being the Manchester suicide bombing at an Ariana Grande concert earlier this year.